It was a wonderful event on March 16th. We had created the first ever Vancouver Squeezebox accordion parade for the 10th Annual Celticfest St. Patrick’s Day parade, walking beside our 5 person Chinese parade dragon – then we zipped down to the Floata Chinese Restaurant to prepare and set up the 17th annual Gung Haggis Fat Choy Robbie Burns Chinese New Year Dinner. This entry was posted in Uncategorized on March 17, 2014 by admin. Hoping the weather turns nice for the St. Patrick’s Day Parade tomorrow. Here is our gang from last year holding up our parade dragon. 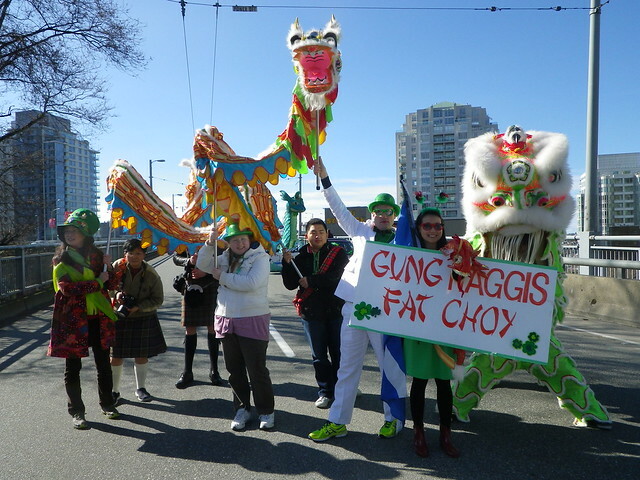 We have always had a Gung Haggis Fat Choy entry… in the annual Celticfest St. Patrick’s Day Parade. It was back at the 2004 Gung Haggis Fat Choy dinner that one of the organizers asked me to put together an entry. “What kind of entry would you like?” I queried. “How about a dragon boat?” I asked, without realizing how much work it would be. Our group is entry number 64 of 74 entries. We meet at the marshalling area on the West side of the Granville St. Bridge – close to mid-span. We meet at 10am, Our car/float will be in place by 9:30am. The St. Patrick’s Day Parade starts at 11am. It will follow the same route as in 2013, beginning on Howe and Davie, proceeding north along Howe to Georgia, and ending at Georgia & Granville Streets. This entry was posted in Uncategorized on March 15, 2014 by admin. 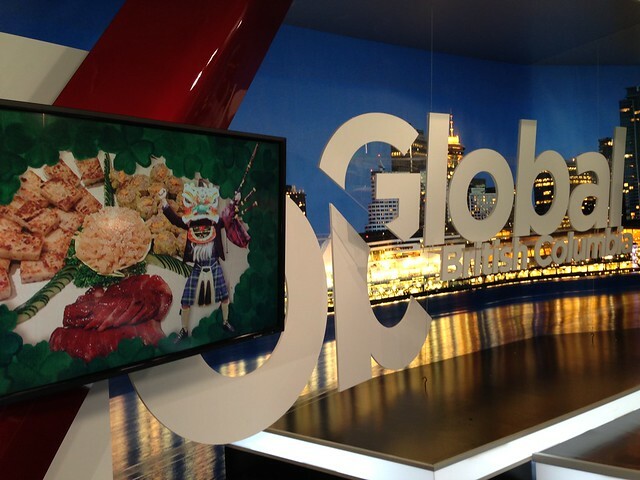 Global Weekend News – Lynn and Jay go Gung Haggis Fat Choy! 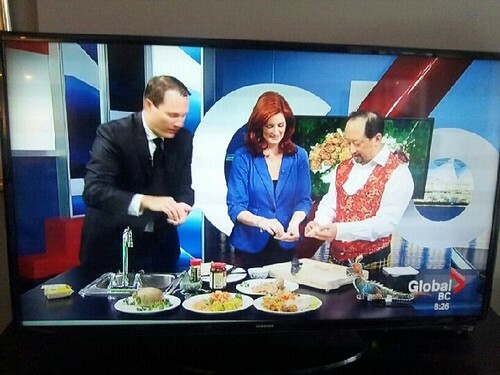 Thanks to Global News for having me as “chef” this morning. I brought some some pre-cooked haggis dim sum from Floata Restaurant, that are used as an appetizer dish for our Gung Haggis Fat Choy Robbie Burns Chinese New Year Dinner. 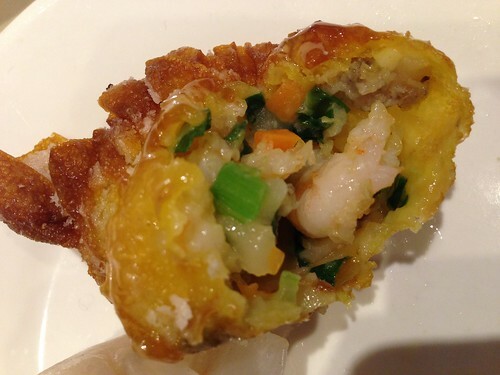 I showed hosts Lynn and Jay how to fold haggis & prawns won ton, but the wrappings were a bit too small and dry. But they really enjoyed tasting the haggis & prawns dumplings that I had picked up from Floata Restaurant the night before. Re-heated dim sum… mmmm…. yum…. This dinner is a fundraiser, for Asian Canadian Writers’ Workshop / Ricepaper Magazine, and for the Gung Haggis Fat Choy dragon boat team. 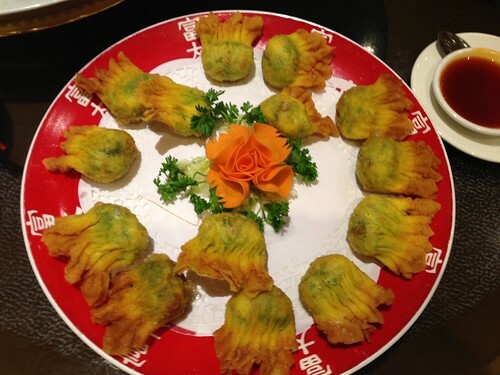 We serve a full Chinese banquet dinner with traditional haggis + fusion haggis cuisine. About half the dishes are vegetarian, including hot & sour soup, turnip cake, deep-fried spicy tofu, and buddhist feast. And Robbie Burns poetry is featured in many different forms… We are very pleased to feature Victoria Poet Janet Marie Rogers to read Pauline Johnson poetry, as well as her own spoken word poetry. Our featured Asian-Canadian author is Janie Chang, just nominated for a BC Book Prize for fiction for her novel Three Souls. Brandon Gabriel will read a poem by his great grandfather William Slepass, a Kwantlen First Nations Chief. Featured musical performers are Silk Road Music’s Qiu Xia He and Andrew Thibault – who were featured in the CBC television special Gung Haggis Fat Choy in 2004. Celtic accordionist Amy Stephen will bring her husband Amir Haghighi for a special treat – perhaps combining Celtic music with Persian music for a St. Patrick’s Day Persian New Year fusion. And of course, we have lots of great raffle prizes from Vancouver Opera, City Opera, Firehall Arts Centre, Harbour Publishing, Tradewind Books, Arsenal Pulp Press, Dr. Sen Yat Sen Classical Chinese Gardens and more! 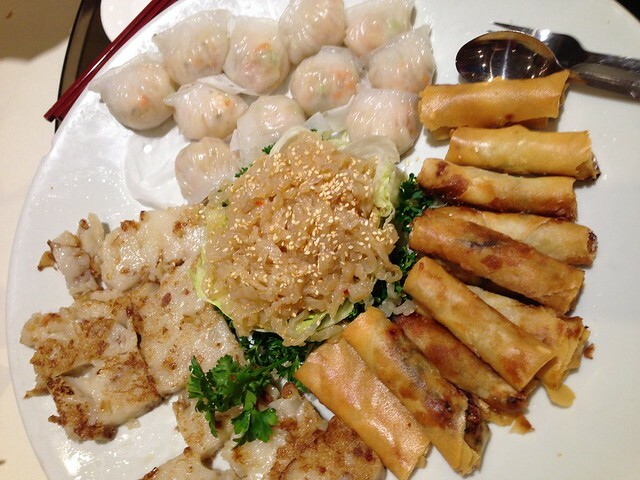 Spicy Jelly fish (centre), pan-fried turnip cake (left), steamed haggis & shrimp har-gow (top), vegetarian spring rolls (right). Wednesday March 12 – we always have a taste-testing dinner to make sure the food meets our expectations. This is especially important when the kitchen doesn’t normally cook with haggis, and we are aiming for something special for our guests. This year, the kitchen was more adventurous, and made us 3 different haggis dim sum dishes. Haggis & pork shu-mei, steamed haggis & prawns har-gow dumplings, and the shanghai styled haggis & prawns won ton dumplings. Inside the delicious Gung Haggis dim sum are: prawn meat, green onions, water chestnut, diced carrots, haggis + secret ingredients! Traditional haggis, is served with a vegetarian lettuce wrap. This entry was posted in Uncategorized on March 14, 2014 by admin. 50 pounds of haggis – ready to be transformed into Chinese cuisine! 50 pounds of Haggis, that I picked from custom haggis maker Bruce Roane this morning. It is now delivered to Floata Restaurant in Vancouver Chinatown where it will be readied and served with for sweet ‘n’sour sauce and/or BBQ plum sauce, for Sunday’s Gung Haggis Fat Choy St. Patrick’s Weekend Dinner. 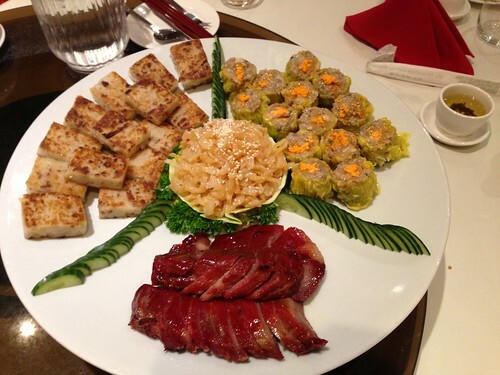 And it is going to be served both traditional style, and also transformed into Chinese dim sum appetizers! For 2014, we are featuring Bruce Roane’s custom haggis. You won’t find it easily anywhere. You have to track Bruce down… and custom order – if you want some of the best haggis around. Well… I admit that I didn’t use Bruce Roane’s haggis for the 2010 Gung Haggis Fat Choy Dinner. In the past years, I have eaten Bruce Roane’s haggis at Burns Suppers for the Robert Burns Society of Vancouver, and the JP Fell Pipe Band. With my friends, and many people, there are lively discussions on the quality of the haggis. Some people love a Peter Black haggis, which we have used for the past 10 years. Some people “dinna like it”. 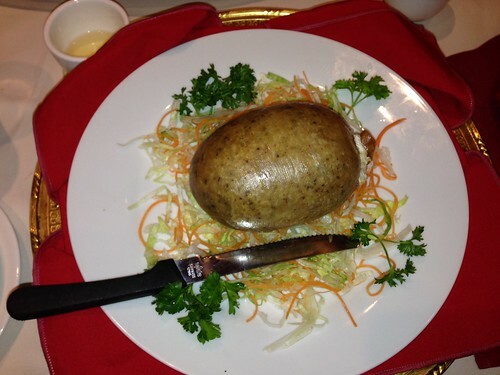 Some people love a Bruce Roane haggis – others “dinna like it, either”. My opinion: It’s a good haggis, and I like it. And it’s going to be served at the 2014 Gung Haggis Fat Choy Robbie Burns Chinese New Year St. Patrick’s Day Dinner on March 16th. Also on the menu will be: Chinese pan-fried turnip cake (low-bak-goh) and steamed haggis & pork dumplings (siu-mei), served alongside spicy jelly fish. Just call me Todderico Wongiovanni. I felt very Italian attending the Vancouver Opera’s Don Giovanni opera on March 1st. Mozart is always very accessible, and I have always remembered the Commendatore Scene from both the play and movie Amadeus. “Don Giovanni” – the ghost of the commendatore sings… in baritone. This story is based on the womanizing character of Don Juan/Don Giovanni, performed on different nights by Daniel Okulitch and Brett Polegato. On Opening night Okulitch was a perfect rake, playing women against each other, lying with deceit, and masterminding his selfish games for his own purpose. The other principal roles of Donna Anna and Donna Elvira, as well as the Commendatore (Donna Anna’s father) are also all played by double performers. On opening night Erin Wall and Krisztina Szabo were brilliant in their seductions and seductee roles. The highlight of this opera is the set design with multiple projections that easily and quickly tranform a castle ballroom into an outside street scene and back again. The creative figures of statues and use of angles give an imaginative depth of field. Inventive was also the use of a walkway surrounding the orchestra pit, that allowed the performers to come closer to the audience and give more room for staging. It really felt more intimate with the four lead singers standing so close to the audience and singing, However, the orchestra seemed more muffled, and less brilliant in sound quality. For the last decade, we have expected and received nothing less than perfection from Vancouver Opera. This production is the first exception. The singers and orchestra were grand, of course, but the staging left a lot to be desired. Having the stage extend out into the audience and around the orchestra pit created the difficulty of having the singers have to project even farther over the pit and stage. This created some balance problems where the singers were hard to hear, and the orchestra sounded small and muted. The Opera has been experimenting recently with “audience engagement.” They have brought in performers before the shows to mingle with the audience, and have a photographer at the entrance for guests to create a souvenir of the evening, and for the Opera to use in future promotions and on social media. Look at us, were having a great night out! The images were spectacular, but could also be distracting. A night out at the opera is always an evening to be celebrated. The roles were well cast, and the story, while long, did not drag. VO is to becongratulated for the exceptional quality of the shows, and their attempts to stay modern and relevant in the 21st century. I truly appreciate the way they are reaching out to new audiences and taking chances on commissions and unusual programming. This entry was posted in Uncategorized on March 7, 2014 by admin. What happens when Gung Haggis Fat Choy celebrates St. Patrick’s Day? What Happens when you celebrate the Pioneer cultures and history of BC all together in one night? What Happens when you celebrate Gung Haggis Fat Choy Robbie Burns Chinese New Year Dinner on St. Patrick’s Day Weekend with First Nations’ iconic poet Pauline Johnson? Reserved Tables of 10 $650 – includes bottle of wine at your table! For 2014, the date was moved to March 16th, and we are going to also celebrate St. Patrick’s Day, and First Nations culture and history, in this Year of Reconciliation in the City of Vancouver. Did you know that the first Premier of BC, was born in Ireland? John Foster McCreight was born in Caledon, County Tyrone. Caledon also means “from Scotland”. The most iconic First Nations poet of Canadian history has to be Pauline Johnson, (also known in Mohawk as Tekahionwake. She was a late 19th Century Canadian writer and performer that traveled across Canada. We will continue to celebrate the fusion of the Scottish Robbie Burns Day and Chinese New Year cultures and traditions, to recognize the fist non-native cultural pioneers of this province. The Scots came from the Far East, across the Atlantic, as the first White explorers, such as Alexander Mackenzie and Simon Fraser. And the Chinese traveled from the Far West across the Pacific, first as Buddhist Monks, identifying a land to the East of China as “Fusang”. Every year we celebrate with a mix of culinary cuisine featuring deep-fried haggis wonton and haggis dim sum, as well as traditional haggis served with Chinese vegetarian lettuce wrap. Victoria Poet Laureate Janet Marie Roger, who is also of Mohawk ancestry – just like Pauline Johnson, and will perform her own spoken word poetry as well as work by Pauline Johnson. Chinese-Canadian author Janie Chang will bring us a special story. Her new novel Three Souls is #2 on the Asian-American best sellers list in the USA, right behind Amy Tan. Celtic storyteller Mary Gavan will regale us with amazing stories of Celtic songs and Robert Burns. Amy Stephen, celtic accordionist with Mad Pudding and Vancouver Intercultural Orchestra, will also bring her magic fingers and songs. Kwantlen First Nations artist Brandon Gabriel, also brings his Chinese and Scottish ancestry into his contemporary artistic life. He will read a poem from his great great grandfather, one of the first First Nations poets. Co-hosts are Chirish sibilings of Chinese and Irish ancestry, broadcaster Margaret Gallagher and actor Patrick Gallagher. Gung Haggis Fat Choy Pipes & Drums will bring their unique fusion and musical surprises! 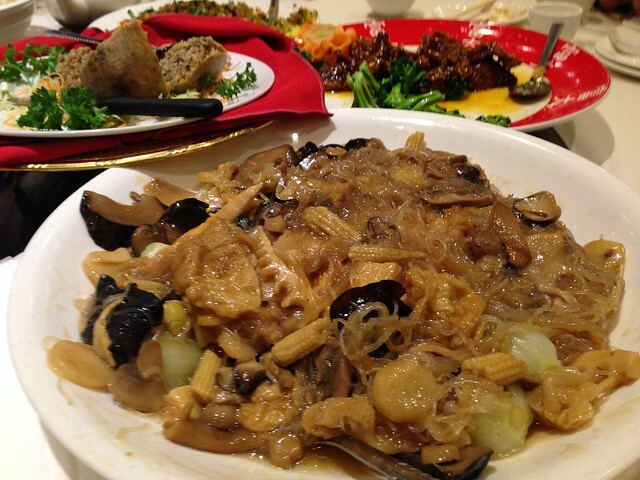 This entry was posted in 2014 Gung Haggis Fat Choy Dinner, Uncategorized on March 6, 2014 by admin.